During the early stages of game week 13 I thought the week was going to be a complete disaster. The transfer didn’t pay off, Maddison got sent off, Leicester lost their clean sheet early on, etc. However by the end of the week I was a little surprised that the team hadn’t dropped further on the overall leaderboard. After only scoring 55 points, the team had dropped by less than 1,000 places which was a fairly good result overall. I’d much rather see progress up the leaderboard however based on points on the board this week, I wasn’t overly unhappy with how the week ended. Goal for and a clean sheet for Laporte across two games was a decent return. Mane getting 10 points across two games was a bonus. Although I had hoped for a little more from him given his recent dip in form. A goal for all three strikers was good to see and 16 points for Kane were more than welcome. I’ve now got 4 players from teams who aren’t in Europe – Richarlison, Doherty, Schmeichel and Maddison. I’d say all 4 are weak links to a certain extent. With two transfers remaining I may look to move a couple of them on before the weekend. The two I see as the weakest are probably Maddison and Schmeichel. I’ve been pleased with the points return I’ve had from Schmeichel, however Leicester’s fixtures take a turn for the worst in December. I’m tempted to move him on for a more premium keeper. Equally Maddison is another player who hasn’t been performing from a point scoring perspective. It’s getting to the point where I think there may be better options at his price tag. With some money in the bank I’d ideally like to upgrade these two to a couple of players from the top teams. Both Chelsea and Man Utd look like they have decent fixtures during December. I could be tempted to swap the two Leicester players for Kepa and a Man Utd defender such as Shaw. Kepa is playing in the Europa league and I see him as a significant upgrade on Schmeichel. Man Utd and Shaw haven’t done overly well this season, however with 2.7m to play with he’s the only real option when it comes to a player from one of the top teams. Looking at the fixtures, I’d probably take a punt on Shaw getting more clean sheets than Maddison gets goals in December. So this could be a slight upgrade as well. Any thoughts on this would be appreciated. I have a hunch Madison might want to repay his sending off but do agree Shaw is an upgrade – what about Ashley young ? I know he hasn’t scored well but for clean sheet potential he’s cheap? I think the Kepa one is a no brainer he’s a stick with once you get him or how about Dea gea he is cheaper? Incidentally what’s your view on switching Mane to Sane or D Silva? 1 transfer left 100k in bank ? I think I slightly favour keeping Mane at the moment – he’s got really high ownership in a mini league I’m in so it would be a big risk to take him out. Prefer Shaw to Young as I think he should get a bit more game time. I don’t think I’d do much with your team as you’re already in a stronger position than I am. It could work out but really depends on the rest of both of your teams. I could see City having a good game but who knows who will get the goals or even be selected based on how much they rotate. I wouldn’t get too caught up with feeling you need players from teams playing in Europe exclusively DTT. After next Gameweek there are no European games until mid February so plenty of time to get them in place before then. I agree that it’s probably time to look at moving Schmeichel and Maddison on though, with probably Doherty, Richarlison and dare I say, Hazard the next players in the list with question marks beside them. Yeah I agree regarding Europe but for me I guess it’s more about having players from the top teams who may put a run together over the Christmas period. Chelsea and Man Utd both look like they’ve got some decent fixtures approaching. I’m gutted they’ve gone behind. 18 points would have been a very nice start to the week. Yeah, Wolves’s form is a cause for concern now. Two losses against both Huddersfield and Cardiff isn’t good enough. Have other teams now worked out how to counter their tactics? Yeah it’s a tough one – while he’s still picking up points I’m less bothered but he’s not going to keep scoring. 18 points would have been very nice though. Thought they were going to be pushing for a top 8 position but I’m not so sure now. I’ve only got one transfer left so I’m opting for Maddison out, Shaw in. Maddison definitely won’t score any points as he’s banned but versus Watford (who have been a bit inconsistent) Schmeichel could grab something. May be famous last words but that’s my punt. Who’ve Chelsea got again? Makes perfect sense to do that transfer – Chelsea have the better fixtures slightly. DTT do you plan on doing these before tomorrows kick offs ? When are you actually going to decide ? I’ll put a post up in the morning to confirm 100% but I’ve pretty much decided I’m making those transfers. Have this months transfers expired now? I made my final change last night prior to price changes but assumed I would be able to reverse this anytime before either player plays on sat? It’s December tomorrow don’t we have to make Nov transfers tonight ? I’ve assumed that I’ll still be able to use them until we get fresh ones. Says on the website that November transfers expire at 06:59:59 on Friday 7th December. 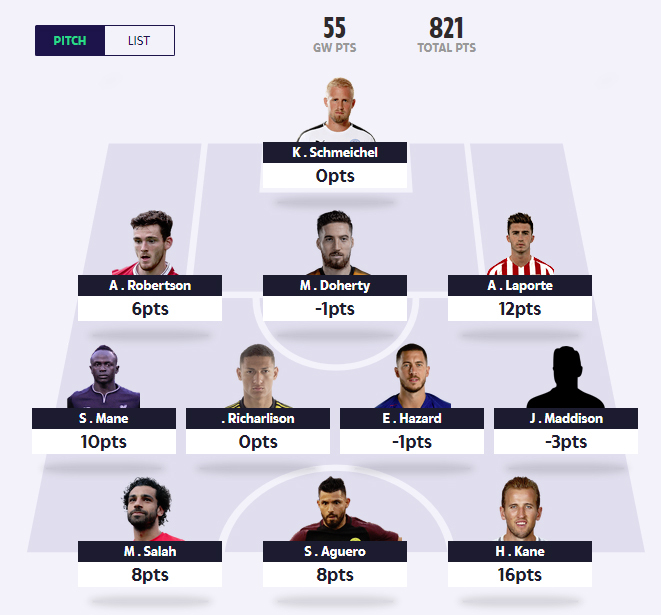 This is what I thought but I am unable to reverse the transfer I made last night even though neither of the 2 players have played this game week? If transfers are made before the 7am Friday game week deadline each week then these transfers are locked and you can’t change them. If you make them after 7am on the Friday these can be changed up to the kick off of either team. The advantage of making them before 7am on the Friday is you can beat price rises or deductions but the risk is you can’t reverse them. This guy has got previous though when he said he was sitting out the Huddersfield game and we all know what happened there! Hoping for a similar result! With Jesus probably out of contention I’d be amazed if there was anything in this. Probably means they’ll be playing mid-week though whilst the likes of Sterling are rested…….I hope.